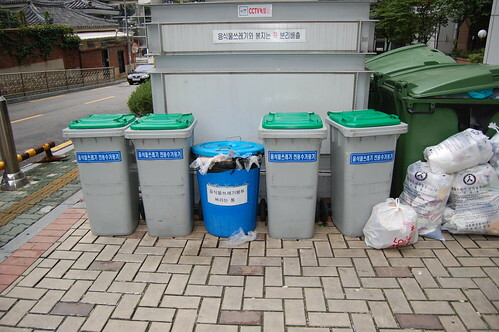 This post is specially aimed to those who just moved in to Seoul or don’t yet really know how to handle their garbage. 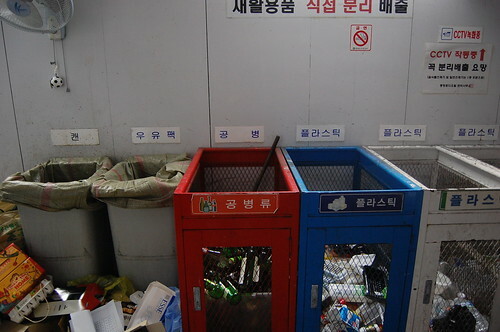 When I first arrived in Seoul, one of the things that surprised me the most was how seriously they take recycling here. 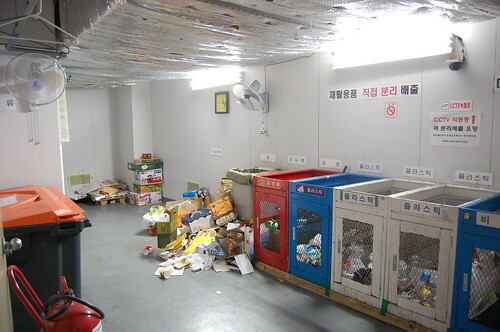 For all westerners, Korea is a country with too many rules (written and unwritten), and garbage disposal is not an exception. You can think about food waste as “anything that can be eaten by an animal”. This means bones, shells, toxic or strong spicy food (like a swell-fish) are not food waste. You should keep your food waste at home in a small plastic bag and throw it away without the plastic bag. 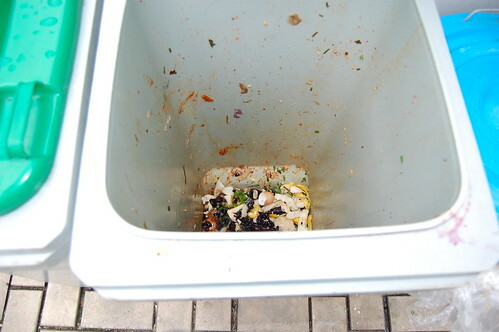 The container for the food waste is undoubtedly the most unpleasant one (sorry for the picture if you were eating…). General waste is anything that can’t be recycled and is not food waste or a bulky item (such as a couch or a table). The idea is that people have to pay for the waste they generate. The more waste you generate, the more you have to pay. 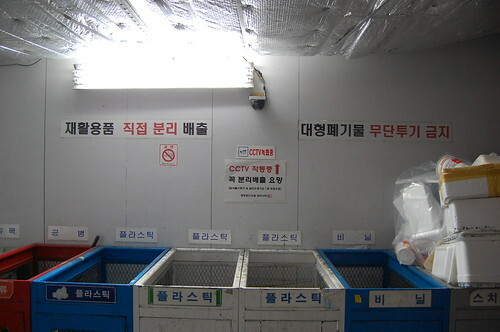 Container for the general waste (일반쓰레기). On the sign you can read “By all means, use only standard bags”. Containers for food waste and general waste, located at the back of the building where I live. Under the CCTV sign, the say that you have to throw food waste without the plastic bag, which you have to place separately in the blue bin. These are the standard bags that you have to pay for. Every building has its own recycling facilities where you have to take your trash and classify it by paper, glass, vinyl, plastic, milk packs. 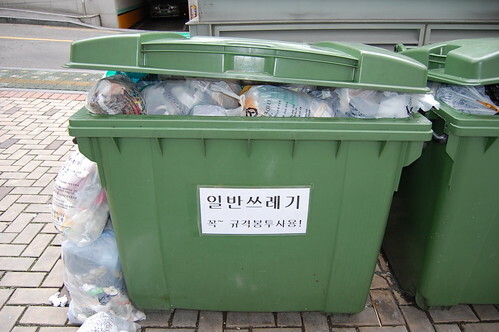 The signs are usually written only in Korean, but you don’t need to know what they say, just look at what’s inside every bin and put the same things inside (not too difficult huh?). This is the recycling room in my building. Usually they are at the basement of every big building. 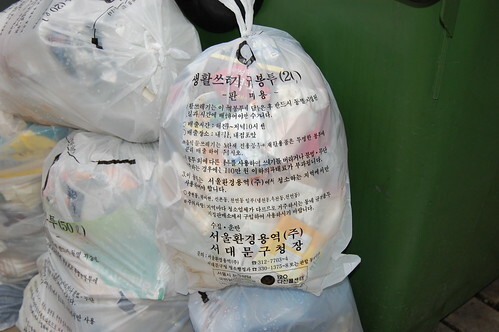 Korean signs for bottles (공병), plastic (프라스틱), and vinyl (비닐). 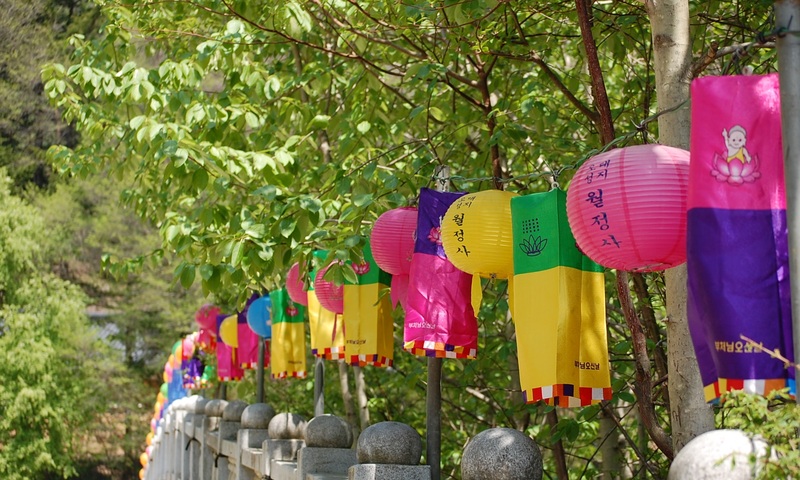 Korean signs for styrofoam (shock absorbing material found in electronic products’ boxes, noodle containers, etc. ), fluerescent lamps, bulbs, and batteries. 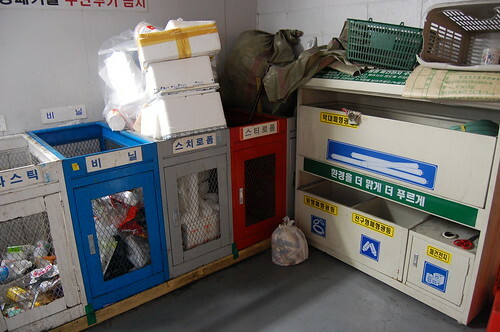 Here on the left, you can also see the containers and signs for cans (캔), and milk packs (우유팩). 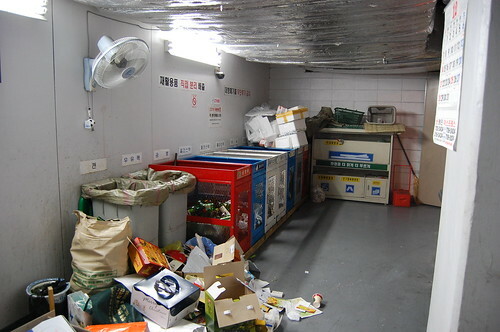 Another view of the recycling room. You also have to pay to throw away large items such as a couch or a chair. The price depends on what you are throwning away, from 2,000 KRW for a small fan to 15,000 KRW for a double bed or a piano. The process to throw away such an item is kind of complicated, you have to go to your neighborhood’s local office, pay the fee over there, and they will give you a sticker that you have to put on the item once you throw it away so that they pick it up on they day they will tell you. The main source for this post was a brochure I got at Seoul Global Center (SGC) entitled “Living in Seoul 1: Garbage Disposal”. If you are in Seoul, the SGC is at the Press Center near the city hall (City Hall subway station, exit number 4). They can help you with this and many more things. Seems like you’re still living in the Dioville. Man, I wish my building’s recycling room was as well organized as yours. There are about the same number of containers, but only about three labels, and people seem to be putting plastic bottles (among other things) in all of them. The only thing I can recognize is the food waste bin, and that one is thanks to this post! I was just looking for the baby diapers disposal system, do you have any idea?